It’s that time of the year again! Carl V. is once again hosting the fabulous Readers Imbibing in Peril challenge – this is the 9th year. Can you believe it? I may be far behind on my reading goals and challenges but that won’t stop me from signing up for this one. I love spooky stories and this time of the year so sign me up. There are several levels of participation and I’m going to shoot for Peril the Second. This means I get to read two books of any length that fit the R.I.P. categories which are mystery, suspense, thriller, dark fantasy, gothic, horror and supernatural. I’m also going to try and do Peril of the Short Story. I do read a lot of mysteries but for this challenge I try to read books that more traditional horror, thriller or suspense stories. You know, make myself go outside of my comfort zone. I haven’t decided which books to read but I do have some good choices to choose from. I have quite a few other books that would be perfect for the challenge so I can’t wait to go digging through the bookshelves. Let me know if you’ve read one of these and think I should read it for the challenge. I know a lot of you guys are participating so have fun and can’t wait to hear about your spooky reads. Love your choices of books. They sound intriguing by the titles. And don’t forget, Ti and I are hosting a readalong of “Something Wicked This Way Comes” in October! Very excited to read (actually listen) to that one. Oh, Haunted Castles look like it might be filled with chills! I’ve been meaning to read Lovecraft for RIP some year but once again I left him out. Poor guy. I’ll be looking forward to what you think of him! Good luck! Anna Dressed in Blood was a lot of fun. I really liked that one a lot. I love this time of year–can you believe it is already September? You are in for a treat with Don’t Look Now–I read it a couple of years ago–she is a wonderful short story writer! 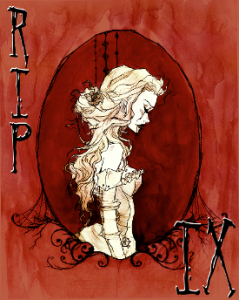 Anna Dressed in Blood is a great choice for the R.I.P. challenge. I read it earlier this year and loved it. It’s one of the better ghost stories out there. Hope you enjoy it! I overlooked Anna Dressed in Blood for some reason. Now, I’m definitely more interested! Love this Challenge and glad to see you back in the blogging game! These sound like they would be good picks, Iliana! Good luck with the challenge!